Pulpit Harbor - Internet At Last! We awoke to full sun but could see a fog bank out in the bay. We waited until 11:00 hoping the fog would clear but it never did so off we went into the whiteness. We're further downeast now where water is colder which causes more fog to form. It can still be fog free but when conditions are marginal for fog, it will form here first. So we put the radar, chartplotter and fog horn to good use. It would be easy if it weren't for the lobster pots but you have to look out for them while checking the radar for on-coming boats - and staying on course - and blowing the fog horn every two minutes. Northeast Harbor was very busy with the most boats we've seen all summer. They don't seem to have been affected by the fuel prices since motor boats are well represented. We picked up a mooring ($25) and had a view of the harbor as we ate salmon we found at a fish market in town. 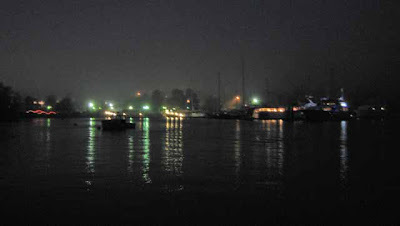 As the evening progressed, the fog returned which looked pretty provided you're not out in it navigating. With darkness falling, the fog gave the lights a diffused glow, nice. After we went to bed I got up and looked out the wind and the stars were out. I got Ann up and we went out on deck to marvel at the stars! The Milky Way was visible right down to the horizon! Overhead the stars were brilliant, I've never seen them so bright and the Milky Way was clearly visible across the entire sky. The moon was not up so we had a dark sky for viewing the stars. We were just stunned. Living near civilization (and lights!) you get used to seeing just a few stars at night. 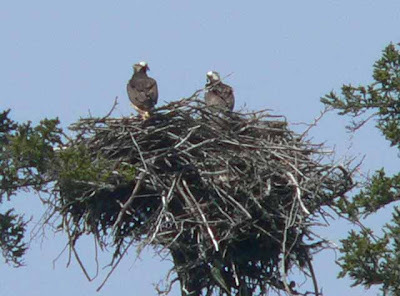 It's quite a sight out in the Maine islands. Morning dawned once again with full sunlight and no fog. We had our breakfast in the cockpit watching the lobstermen hauling traps. The wind came up, around 6 to 8 kts so we hauled anchor around 11:00 and started out. 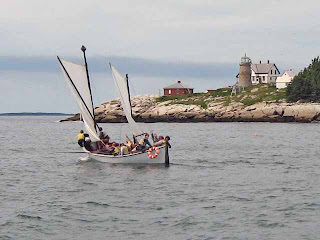 The fun part of sailing in Maine is that you're not in a hurry. We had only 10 miles to go so were we happy with our lazy sail of 3 to 5 kits towards Mackerel Cove. The sun was out, the sky was blue, the winds were warm, we had fun sailing. 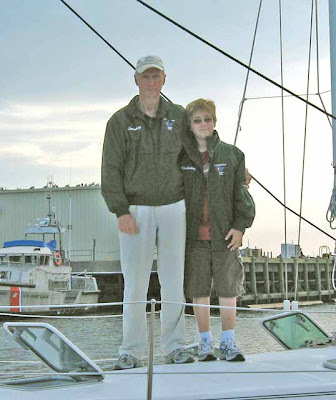 I still haven't broken out my heavier sailing jacket, the one I wore everyday last year. It's been polo shirt days ever since we've been here. I have a supply of long sleeved shirts, both cotton and flannel along but the weather's been so warm I haven't used them yet. 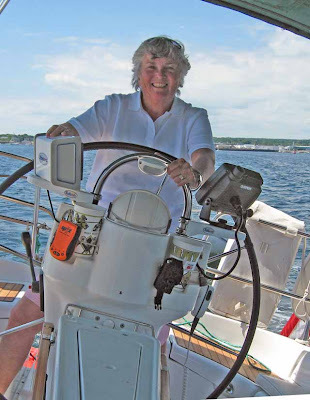 We have an "anchor" marker on our chartplotter for the best place to anchor in Mackerel Cove so we headed right in with Ann at the helm and me at the bow ready to drop the anchor on her signal. Once executed, Ann marks the spot on the GPS and backs down to dig the anchor in. It's very hard to drag an anchor in Maine! The bottom is 95% of the time mud, thick gooey mud. In most places you could probably anchor with 1:1 scope! However, we had a surprise. Just behind us was a lobster trap line floating on the surface. If we had caught that in our prop as we were backing down, it would have been trouble. Lobstermen often two floats with a string of lobster traps between them. What was floating was a line between one of the lobster traps in the string. Normally, the line is not visible since the traps are usually in deep water. Here the traps were only in 10 ft of water and since the line floats, it was near the surface. What a hazard! 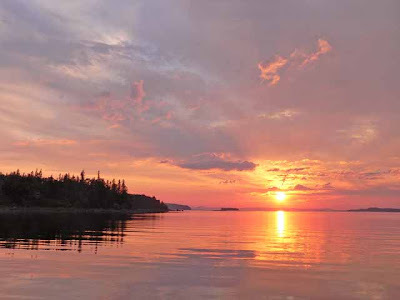 Tomorrow we're headed for Northeast Harbor where there should be an internet connection! The sun rose with blue skies and no fog. Unfortunately, there was also no wind. We had over 20 miles to go so we left around 11:00 and motored to Southeast Harbor on Deer Island. In Maine it is never a good idea to be on a schedule. The winds eventually come, sometimes by 11:00, sometimes by noon and sometimes by 2:00 pm. Today the winds came at 2:00 but we were already in our harbor. In the Caribbean, you sail in the morning and relax in the afternoon. 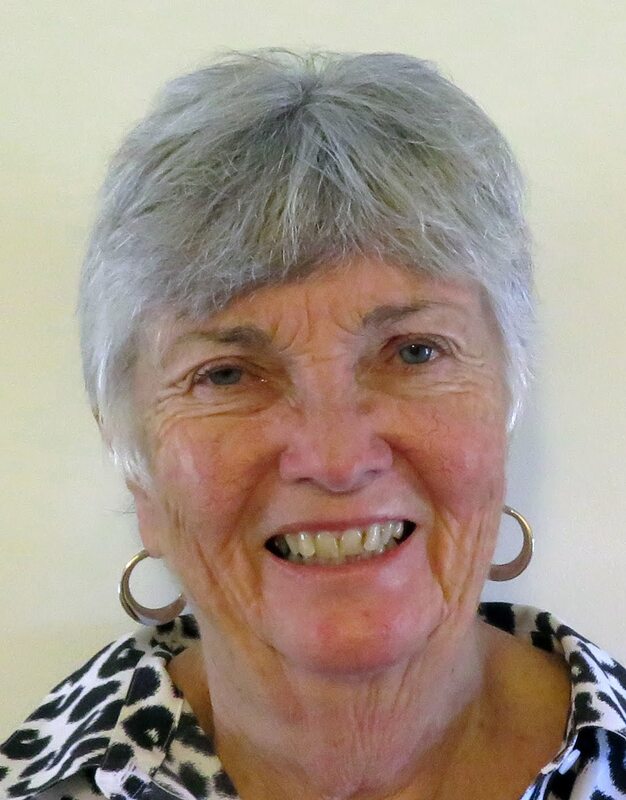 In Maine, it's just the opposite: you relax in the morning and sail in the afternoon, you just have to be patient for the winds to rise - otherwise, you spend all your time motoring. Southeast Harbor is completely protected from all directions which is a good thing since a thunderstorm roared through after we had anchored. All afternoon we watched the thunderheads build up and pass us by to the north over the mainland (see photos). They made quite a sight, rising up and flattening at the top into the typical anvil shape. Eventually, one finally hit us but the top winds were only 28 kts with some rain, it was soon over. The thunderstorms have a hard time building up to any intensity with the cold water. It's another story over the mainland, there's lot of energy in the heat of the day over land. Mostly, they all miss us. Ann got a good sunset photo as a shower came through which gave the picture a red cast in the upper left corner (from the sunset reflected in the rain). One can just sit in the cockpit and watch the sky and landscape all afternoon, it never tires. 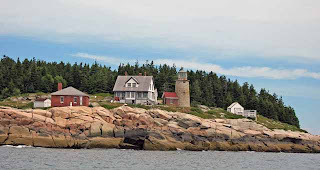 One comes to Maine for the steady southwest winds of 10 to 15 kts with the wonderful views of the passing islands and great anchorages. Today we had all three. 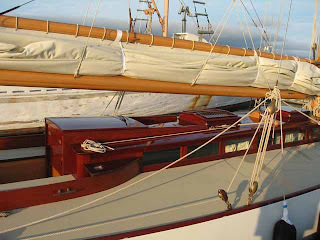 We sailed out of Carver Cove with the wind on the aft starboard quarter, turned the corner to head north and found the wind on the port quarter. There were no waves, just clear, flat water with plenty of wind. 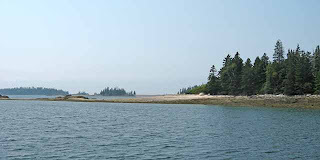 We headed for the group of island just north of north of Northhaven, a Maine archipelago. Turning into the islands, we were on a broad reach with full sun, warm winds and perfection. We said a sad farewell to Matthew and family. After five weeks on the boat, it sure will be different without Matthew around. He's big enough to be very helpful on the boat. He raised and lowered the dink motor to me in the dink, normally that's Nana's job. When we weighed anchor, he used the washdown pump to hose off the mud from the anchor chain and the anchor itself while I raised the anchor with the windlass. In the dink he always steered it to shore and docked it back at the boat. He learned this year how to set the fenders and the lines when we came into dock and when at a dock he washed the boat. He also turned the anchor light on and off when we anchored out. I'll be busier without him. I also relearned how 10 year olds do things. When going down stairs, the last two steps are always taken with a jump. When picking up something in the cockpit that rolled to the other side, he would bend over the cockpit table like a human teeter-totter and fetch what he had dropped. When I asked him, "Why not just get up and go around the table to the other side to bend over and pick up what he dropped", he replied, "That's no fun!" When going down stairs the fun thing to do is to hit the resonate pitch just so, the whole boat would vibrate like the mythical soldiers crossing a bridge that caused it to collapse from their in-step march. He did refrain from doing that after the first few times - after encouragement from us. When descending into the cabin, the last stair was avoided in favor of a direct step to the settee cushions. Oh well. On the other hand, he started to read serious books (Tom Sawyer) while with us for the first time. 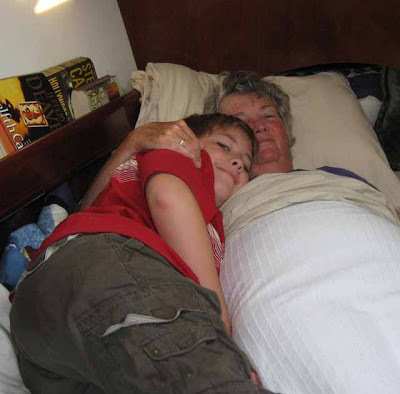 He and Nana had a reading time together every night at 9:00, he never missed that and later on he read on his own. He earned his boat jacket this year and now everyone in the family wants one (first you've got to spend a vacation alone with us on the boat). So we sadly said our goodbyes in the morning and headed east. 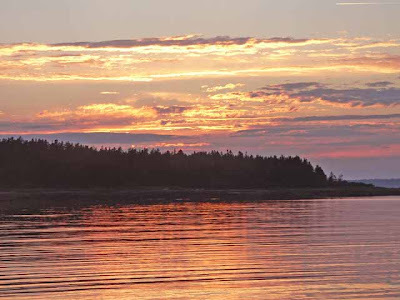 Tonight we're in Carve Cove on Vinalhaven. In the past there have been fishermen that set nets dependent upon the tides. I see the nets ready to be set but 7 boats came in after us and anchored much closer to shore, within the area where the nets are usually set. It will be interesting to see what the fishermen do about that, I would think they are not happy. We're anchored well outside of the net area. 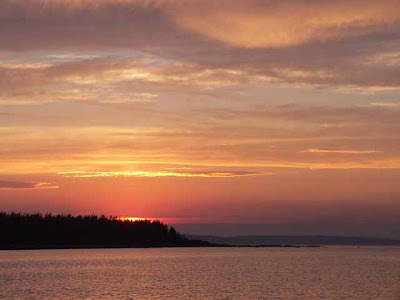 The lighthouse in the photo is the one on the west entrance to the Fox Island Thorofare. We sailed all the way from Rockland to Carver Cove with winds from 10 to 20 kts. We routinely hit 8 kts per the GPS with a triple reefed jib and a reefed main when it gusted to 20 kts. We had a full sun, just a great day except for the beginning with Matthew leaving. We're not sure where we're headed tomorrow, depends upon the wind direction - the first priority is to sail. We refilled our water tanks in Belfast but had to use my carbon filter. Still, it was still much better water than in Rockland which has a strong after taste. We sailed most of the way to Rockland but on the last leg where we motored, we ran in and out of fog banks. As we passed Camden we saw Mt Battie enveloped in fog with the peak still poking above the bank, an eerie sight! Rockland is preparing for their Lobster Fest Weekend which starts Wednesday but we won't be there. We saw signs that they will cook 10 tons of lobsters over the week, hard to imagine that much lobster. We went once again to Cody's restaurant which the kids love since it has the same name as their new puppy. Plus, they can make a mess by putting all the peanut shells on the floor and it's part of the attraction. We'll say goodbye to Matthew and family tomorrow and then we're off towards Southwest Harbor, stopping along the way depending upon the direction of the wind. 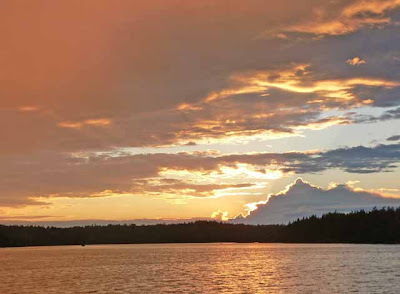 We'll probably be out of range of my internet connection until Southwest Harbor on Friday, oh well. You can still follow our progress as to our location by clicking on Fleetwing Location in the "Where's Fleetwing" column at left. It rained all through the night along with a strong wind out of the southeast. We were snug at our dock but we couldn't open a port due to the constant rain. We had our doradas but it would have been nice to have more fresh air. As morning broke, it continued to rain and finally came to a sputtering halt around 1:00 or so but we could still see fog out in the bay so we decided to say put and explore Belfast some more. 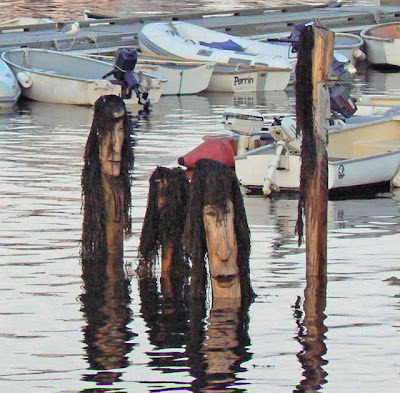 There's a carver in town that produces totems and he put several in the harbor that are underwater at high tide but become exposed at low, it's a strange sight (see photo). 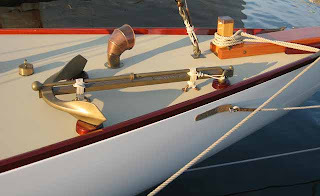 Belfast is also where an annual wooden boat building contest is held that draws builders from all over the northeast. We saw three of one model boat docked nearby so we decided to take a closer look. Needless to say, the craftsmanship is impeccable. The woodwork gleams and the anchor has never seen a sea bottom! Notice how the shrouds are attached to the turnbuckles. They are beautiful to look at but how would you ever do upkeep on them? 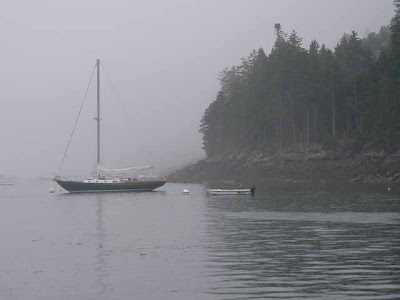 We awoke to rain and fog, our first foggy day since Boothbay (and the very next day after "boasting" in my previous blog that we hadn't seen fog for almost two weeks). The winds were predicted to gust to 30 kts with 4 to 7 foot waves so we headed to Belfast in the morning before the waves built up. We only saw 10 to 15 kts and 1 foot waves but we were in the lee of Islesboro for a good part of the way across the bay. With one of our littlest crew queasy, we just motored across to ensure a quick passage to calm waters of the harbor. Belfast is a very friendly, compact town - all close to the waterfront. The town dockage is only $1.75/ft but if you just wanted to come to the docks for up to an hour for water, ice, etc., it's free. However, the walk through town is all uphill. They had an organic grocery store and a great cheese shop plus many small stores to look around in. 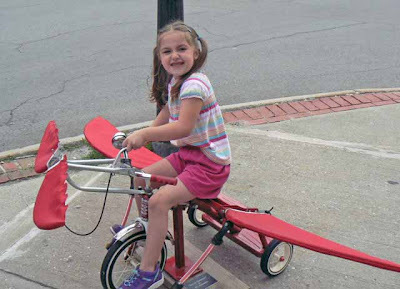 All along the sidewalks they had participation objects (see photos) for young ones to ride, push at, bounce, look etc. Some were very strange but interesting. 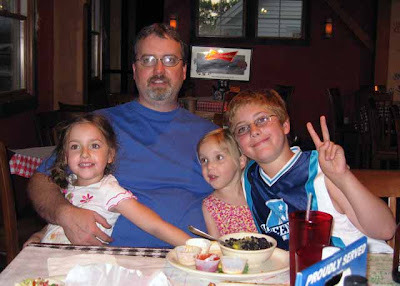 It was Matthew's Mom and Dad's anniversary so we volunteered to babysit the kids while they had a rare night out. Out for pizza I went and we had a feast with onion rings and chicken tenders, much too much but it was good. The wind is supposed to pick up even more overnight and we can see small rollers coming in (Belfast is open to the southwest). Since we're pointed into the wind at our dock, we are hardly affected but boats on moorings are bouncing around quite a bit. 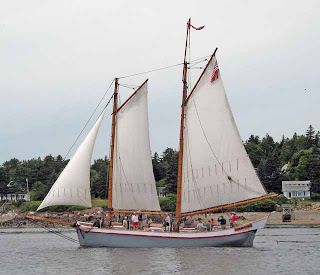 Everything is supposed to subside overnight and we're looking forward to a sail (it's been awhile...) We hope to stay somewhere in Islesboro Friday. It was a little rocky last night. I think it was from the ocean swell from the tropical storms. We're in pretty far but the swell worked its way around the sheltering island although it turned into only 1 to 2 inch ripples, it occasionally got in sync with the boat and caused some rocking when the boat was broadside to the ripples. 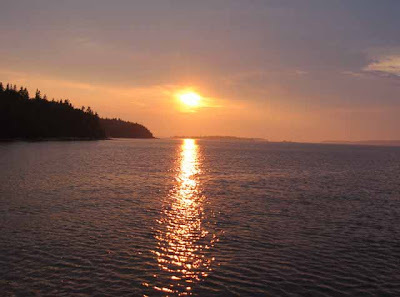 It was the first time the Opechee anchorage was anything but dead calm. The morning was bright sun (we haven't seen fog since Boothbay Harbor!) and headed north through Eggemoggin Reach. The wind was only 6 to 8 kts directly behind us so we just motored. The photo is of "The Rock" at Opechee that all attempted to climb. Matthew gave it a soldier's effort but didn't succeed (I didn't either). We took the southern entrance into the harbor which involved avoiding an unmarked ledge right in the middle of the channel. However, it's clearly marked on the GPS chartplotter so I just followed the chart and we never saw less than 20 ft under us. Holbrook Harbor is a wonderfully protected anchorage. The winds were predicted at 10 to 15 with higher gusts out of the southeast, so the anchorage was perfect since it has protection exactly from that direction. We're in the middle of a thunderstorm now but it's not very intense, the cold water in the area doesn't feed the storms like at home. I'm sure that over the nearby mainland it's much worse. There's a nature conservatory on shore so Matthew and company went ashore to explore and burn off some steam. Meanwhile, the grandparents relaxed on the boat! All is peaceful now, hopefully it stays that way throughout the night. The bridge on Eggemoggin Reach is shown in the photo. We never got the winds predicted (10 to 15 kts) so it was a calm night in Seal Bay. With the lack of wind during the night, we circled the anchor all night, the chartplotter screen had a big circle where the boat went round and round. 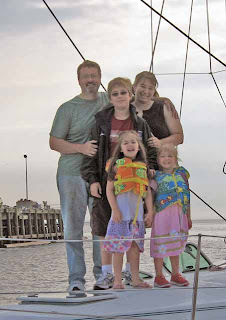 We never noticed it in the boat since it happened so slowly. On the way out of the harbor we saw the seals again resting on the rocks, the girls waved goodbye. We headed to Billings Marine which has very convenient docks for refueling and filling water tanks. We have found they have the best water in the area. Rockland's water has a bad after taste that you can't get out of the tanks. They are very friendly and helpful there with fuel prices the best in the area ($4.79/gal for diesel) with free water. After refueling, we headed for Opechee, motoring all the way since the winds were not enough and anchored in 10 ft of water. 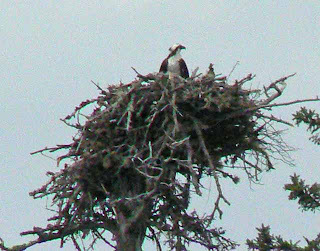 We saw an osprey nest on the way. Ann took a photo of the sunset at Opechee. We didn't have any wind today so we just stayed in Seal Bay and spent the day exploring the area. Matthew and family piled in the dink and did a circle of the bay, looking at the seals and ospreys. 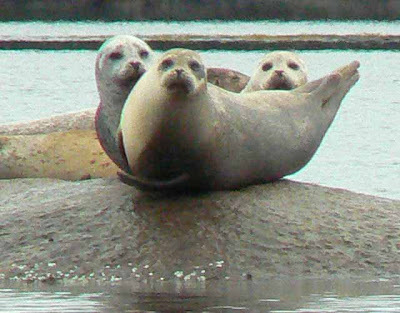 The seals look kind of funny on rocks that are almost covered but not quite. They arch their body so their heads and fins are not in the water. Just before the water covers the rock completely, they appear to be floating on top of the water! 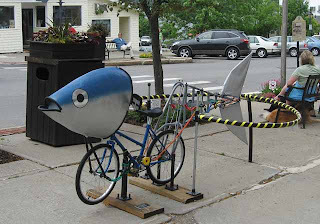 It's as if they don't want to get their fins wet! They are very intent on looking at you as you approach them, then they quietly slip into the water but they still bob up and glance as you go by. We'll head further east tomorrow, depend upon the weather forecast, as always. It was hot in Rockland, we had to run the A/C which was unthinkable last year. We loaded up on groceries for 7 people for a week so we're full to the brim with food. Nana and Monique found fresh, wild salmon which we grilled out. However, we had to motor to Seal Bay since it was raining and there wasn't much wind. We used our new enclosure to keep the rain out so it was a comfortable ride. With the side panels installed, we have the full use of the cockpit even when it's raining. Matthew took a photo of another windjammer but he otherwise has his hands full with his sisters so he's not blogging tonight. On the way in we once again saw seals on nearby rocks as well as poking their heads up to see what was going by. 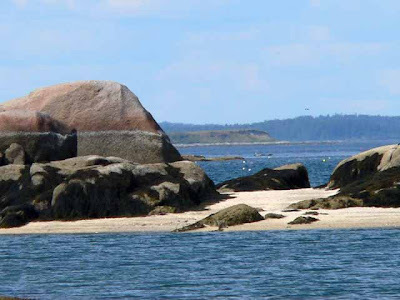 If it doesn't rain all day, we hope to explore nearby beaches for some serious boulder climbing for kid exercising (for a peaceful boat..) If the weather report holds up, we'll be in Seal Bay tomorrow too but we once again have no internet service, oh well. 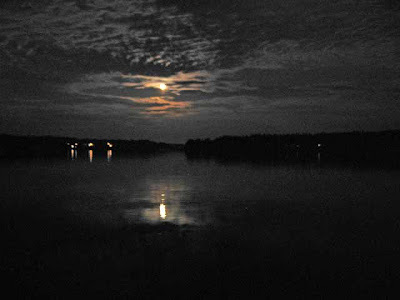 The night at Pulpit Harbor was quieter than I expected. Usually the wind dies and the tide current cause all the boats to go in circles (bumper cars!) However, last night we had a constant SW wind that pointed everyone so all was calm. In the morning, the sun came out as we weighed anchor and headed out. We sailed, then motored and then sailed again. This is the second time we didn't have wind in the middle of the bay but did have wind at the edges, strange. Matthew took photos of windjammers which were out in force since they are mostly based in nearby Camden. Philip, Monique, Sarah and Natalie arrived around 5:30. The girls gave Matthew an enthusiastic welcome! They were held up in traffic for 1 1/2 hours at the New Hampshire toll booths rolling along at 20 mph until clearing the toll booths. I had thought the price of gas would have kept the traffic down but evidently not in this case. We went to Cody's near Rockport for dinner which surprisingly has the same name as Matthew's new puppy, Cody! We plan on sailing to Seal Bay tomorrow which unfortunately does not have internet service so there will probably be another interruption in the blog but it will be published as internet connections allow. Ahoy mates its me Matt. Today I went swimming off the back of the boat and read my book for awhile. Then I played my gameboy for awhile and read some more. We sail for all most the whole trip to Pulpit Harbor. After we arrived I watched the movie Muppets From Space and finished it exactly when Grandpa said "Time to start the blog." More tomorrow on Matt's blog. As usual in Maine, there was no wind in the morning so we waited until 11:00 to leave harbor when we saw 8 kts on the wind gauge. We were on a broad reach and the wind gradually increased to 10 or so. It was overcast but warm. Then a strange thing happened, right out in the middle of the bay the wind suddenly stopped! 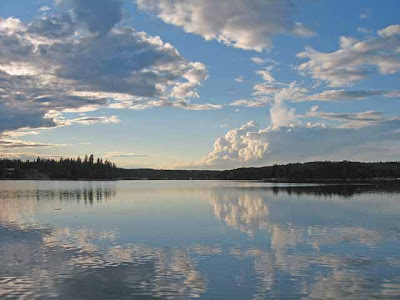 We could see ripples about 1/4 mile away in all directions but where we were at it was dead calm. Finally we turned the motor and powered our way to the nearest wind and we sailed the rest of the way into Pulpit Harbor and found that we had an internet connection finally! The harbor is completely protected and close to Rockland and Camden which usually results in a crowd on a Friday night there was a lot of open area this afternoon. We saw four power boats, the most in one spot since we got to Maine. We also got our first rain while in Maine but no thunderstorms, they stayed on land as usual for Maine. The rains will help since the grass looks brown. 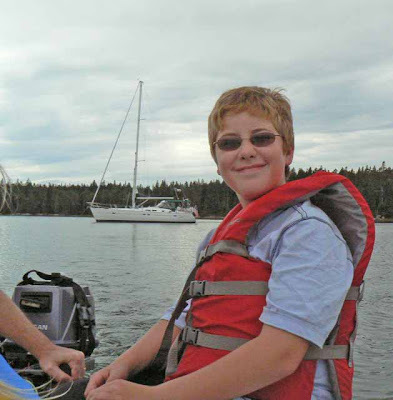 On Saturday Matthew's family arrives for a week on the boat starting at Rockland. 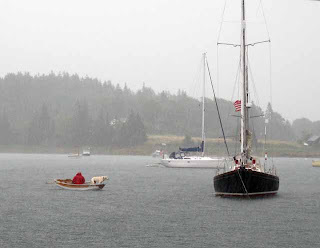 In the photo at right, the man is returning from shore having walked his dog when a torrential downpour started. The dog went directly downstairs and probably shook to shed all the water! We also saw several windjammers ghost by the entrance, beautiful! Ahoy there mates its me Matt. 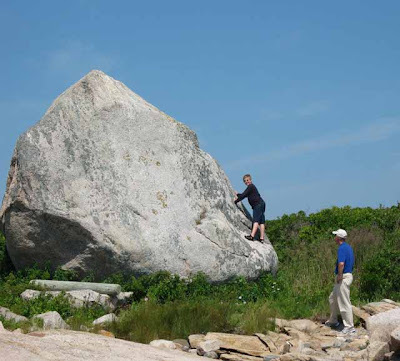 Today we went ashore and we climbed on some rocks and I attempted to climb this huge rock. Then I started the dink twice today. Then I read my new book The Lightning Thief and I'm on page 143 on my third day of reading it. 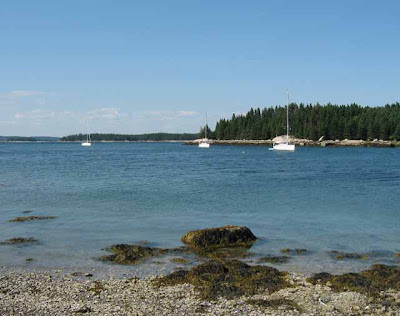 When we arrived in Deer Island Harbor I went swimming in water 68 degrees that is bath water to me. I am having mac and cheese Nana style. Then we will have a game of Munchkins and this time I will not be beaten like the last three nights. More tomorrow on Matt's Blog. We went exploring ashore at a nearby deserted island in Opechee harbor. 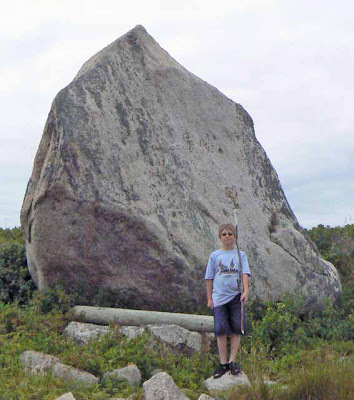 It had the requisite boulders for Matthew to climb but some were too big even for him. 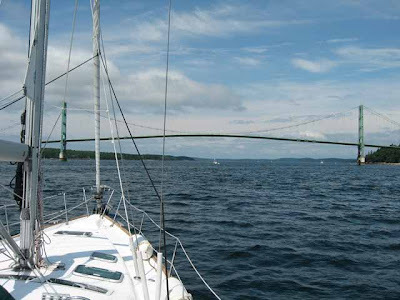 We weighed anchor around 11:00 and headed through Casco Passage to destination at Northwest harbor in Penobscot Bay. Since we're picking up Matthew's family on Saturday, we wanted to be closer to Rockland on Friday night. Even though the lobster buoys are numerous, they don't seem to be as numerous as last year. I could actually navigate through Casco Passage which is pretty narrow without too much trouble. I recall having a much harder time of it last year. Also very noticeable is the much warmer weather and, so far, the lack of fog. In our anchorage tonight we measured the unheard of water temperature of 68F. Matthew proclaimed it "bathwater" it was so warm. What a difference a year makes! Our Munchkin games continue unabated every night after dinner. I think it's a kid's revenge for adult games that have a lot of rules, they are nothing compared to Munchkin for confusion to adults - which is probably part of the attraction. 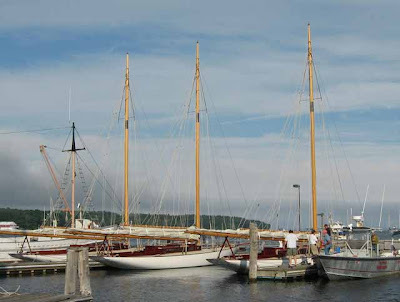 We're headed for Pulpit Harbor tomorrow and hopefully a cellphone connection since Rockland, Rockport and Camden are nearby, all with Verizon service. The only news we've received the last week has been over the VHF for weather, nothing else. However, we had a fabulous sunset and a great moonrise! Ann took the photo of the sunset, we both took about two dozen but hers was the best. Ahoy there mates it's me Matt. Today I went swimming in water that was 62 degrees and when I was swimming I saw a huge school of silver sides that's what the fish are called and they are tiny. Then I watched a movie and then I played my DS for awhile and I watched for pots. After that I played my gameboy for the rest of the ride and started to watch Magic in the Water. Well back to my movie more tomorrow on Matt's Blog. At Round Island, I think we must have circled our anchor about two dozen time, we just went round and round (at Round Island....) One of the hazards in Maine is that the wind usually dies at night and with 10 foot tides and the associated current anchorages are subject to the ebb and flow of water required for the high tides in the area. As a result, if the wind dies, boats are all over the anchorage at night. If you're too close, you'll bump your neighbor (one of the things that go "bump in the night"). However, there were only four boats at Round Island so we had enough room but we did move around a lot. Morning was once again bright and sunny with no fog. The winds in Maine usually do not come until the afternoon so we had a lazy morning, long breakfast, some reading, waiting for the wind. We weighed anchor around 1:00 and headed for Opechee as the wind started to build. 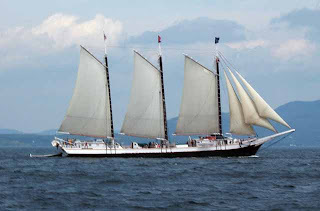 It was between 8 to 12 kts out of the southwest, the usual direction for Maine in the summertime. We sailed all the way to Opechee Island, about two hours, clear skies, warm winds - just a nice sail. We estimate it's a out 10 degrees warmer this year than last year! I've been in golf shirts for the entire cruise, last year I didn't get out of long sleeve shirts with sweatshirt over the top until I returned to Long Island Sound! It's much better cruising this way. Ahoy there mates its me Matt. Today I played my DS for awhile and I took the sail out. Then I played my DS for the rest of the ride until we got to Stonington and fueled up. The guy at the dock was amazed that I have this really old Lord of the Rings game and he said not to lose it. Then we went to Round Island and we went ashore and found a lot of crab shells. I started the dink 2 times and I was getting some cheese and oophs cut myself by accident. More tomorrow on Matt's Blog. After a day of fog it was wonderful to see the sun rise with a bright, blue sky! I took the morning to go over the teak rail in the calm of the anchorage. As we left, we said goodbye to the seals and put up the sails upon reaching the outlet. The winds were only 5 kts at first but they eventually built to 10 to 12 kts. We stopped by Billings Marine to pick up fuel, water and ice, a great place for all three. We filled up with 31.9 gal of diesel at $4.76/gal, the cheapest price we've seen so far although the local loberstermen were really complaining! 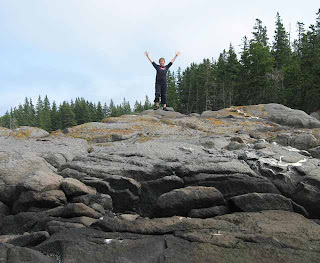 After Billings, we negotiated a dense lobster field with unmarked ledges (but were on the charts!) to Round Island. 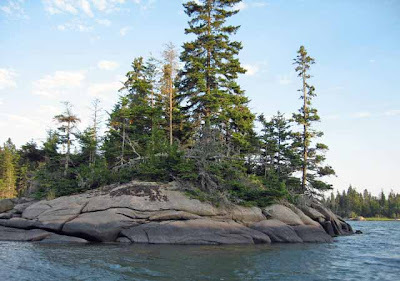 It's a public island so you can go ashore and explore and climb boulders (Matt's speciality). Matt started the motor every time, he's getting very good at it. Back at the boat I grilled a pork roast as we watched the sun set. Of course, we also play a round of Munchkin, a game that only a 10 year old could love (or his dad!). The instructions as very confusing which allows for much argument, which is one of the points of the game I guess. It's like dungeons and dragons with lots of cards to draw, monsters to fight and bonuses to keep track of. At any rate, Nana won but we're not sure how that came about. Undoubtedly, we'll play it again. Ahoy there mates it's me Matt. Today we played Munchkins and Nana won her first game. 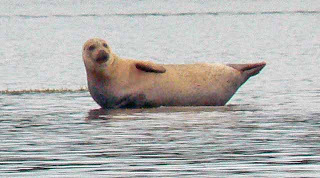 Then we went ashore and saw seals on the way. Grandpa and I climbed on rocks for awhile and we saw a washed up boat. Then when we got back to the beach and I climbed up a big rock and I found a crab shell. 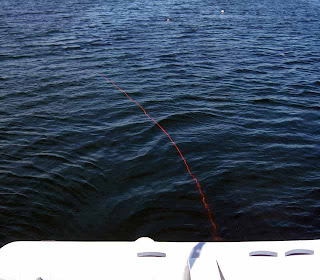 Then we went back and got to dock the dink on the back of the boat having the bow of the dink pointing at the back of the boat. More tomorrow on Matt's Blog. This morning we awoke to fog with not much in the way of wind forecasted so we decided to have a day of exploration of Seal Bay. In the morning we ventured to the western part of the bay, looking for a landing so Matthew could do some serious boulder climbing. 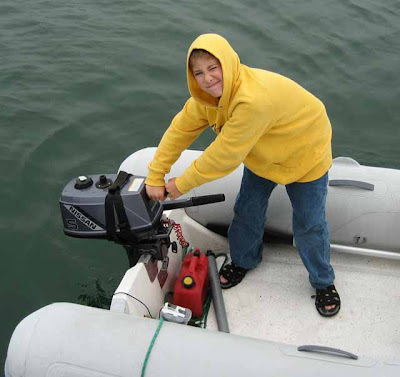 Matthew is now able to start the dinghy motor with regularity, he's getting stronger. 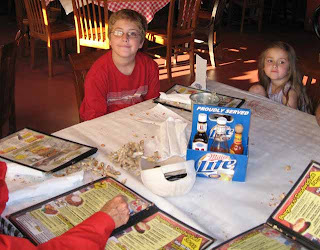 For lunch we had a Nana size helping of chicken salad, a Grandpa size helping and a Matthew size helping - guess which one was the biggest! The sun finally came out in the afternoon and we had our second outing with more boulder climbing. Along the way we motored close to seals sitting on a submerged rock, after all this is called Seal Bay for a reason. They headed for water as we got closer. We often see one poke their head out of the water and watch us as we pass by. Ann found the exact kitchen countertop she was looking for except the granite slab wasn't big enough but the shade was right! She took a sample back to the boat. The amount of granite in this area is just amazing, piled everywhere. You will occasionally see areas where slabs have been cut. We've been told that in the old days boats from England came over and loaded up. Ahoy there mates its me Matt. Today I helped Grandpa install the cell phone antenna and threaded a new wire for the dinks motor cover. Then I watched Arther and the Invisibles in the aft cabin. Then I reread one of my Dragon Ball Z books. Then I cleaned under the table. More tomorrow on Matt's Blog. The winds they did howl, all day long at 15 to 25 kts and through the night. The inner part of Seal Cove is a real hurricane hole so we were secure but it was windy! We put in the side curtains so the cockpit was nice and warm. My boat project for today was to install the cellphone antenna. The antenna itself was not the problem, the problem was in pulling the cable to the nav table, it only took four hours (!) In Seal Bay we had cellphone service but the signal was still not strong enough for digital service even with the antenna. Without the antenna there was no service at all. So the posting of blog reports could be spotty as I head further east even though I will still be writing them everyday. The wind finally calmed down enough for a dinghy ride in the evening and Ann took a few photos. It's amazing how the trees seem to grow right out of the rocks. The aroma of balsam pines and the scenery of the granite and trees is never tiring. Tomorrow we're headed for Round Island, at least that's the plan. Ahoy mates its me Matt. Today I stared the dink 3 times. Then we saw the Rose Way and I got to sail the boat It was fun. I played me DS until it died and Nana let me go on deck while the sails were up. When we arrived in Seal Bay we saw some seals and one was looking up a little bit up on the water and its face was so cute. More tomorrow on Matt's Blog. The morning came bright and warm. It's much warmer this year than last year. We still haven't used the heater yet. I found that the depth sounder wasn't fixed after all. The depth reading was twice the actual depth. With that I removed the old display (Tridata) and replaced it with the new one I bought yesterday, it worked immediately. Since we've had false alarms in the past thinking something was fixed when it wasn't, we'll withhold judgment until tomorrow. While at it, I replaced the genset starter battery - got to have our morning coffee and hot shower! We had a fresh northwest breeze of 12 to 15 kts with crystal clear skies. 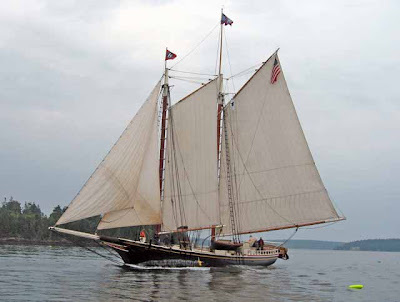 Penobscot Bay is inland a ways so there's no rollers to disturb the perfect sailing weather. 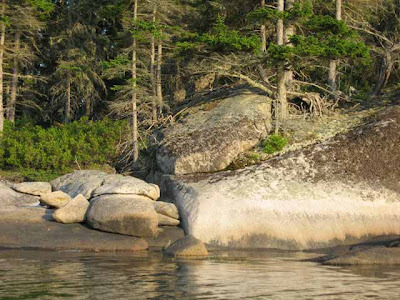 We put up sails in Rockland Harbor and sailed all the way to just outside Seal Bay, all on the same tack and through Fox Island Thorofare too. It was just beautiful and not a hint of fog. I took a temperature reading in Seal Bay and found it to be 66F, last year it was 60F! What a difference a year makes. Even Matthew thought the water was warm. Ahoy mates its me Matt. Today I played my gameboy and read my Star Wars book and finished it. Then I drew for awhile. 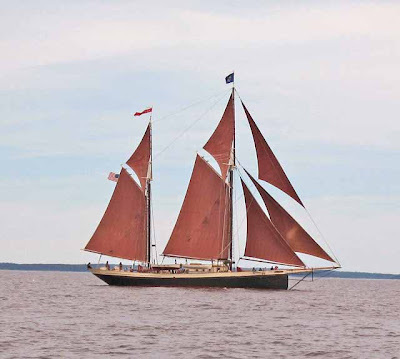 We saw a lot of schooners on on the way to Rockland and I took a picture of one. After we arrived I started the dink when we went ashore. Then Grandpa got a new depth sounder, yeah. Then I started the motor on the dink again and docked it like I always do. More tomorrow on Matt's Blog. Well, we did motor a little bit but we sailed the last three hours from Maple Juice Cove to Rockland. We had a glorious northwest wind that was steady at 12 to 15 knots off the land so there was no fog. It was a broad reach all the way up Muscle Ridge Channel, great Maine sailing. 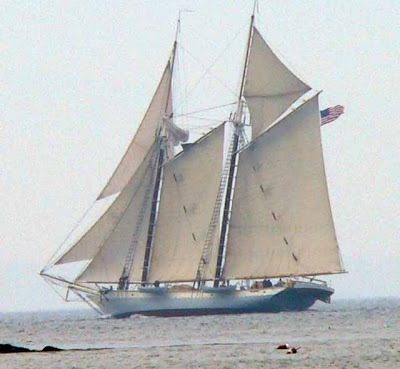 We saw lots of schooners in Penobscot Bay as we sailed into Rockland. We took a photo of Owl's Head lighthouse for the benefit of those who were with us last time that didn't see it (due to the fog). Of course the lobster pots were thick but what can you do? Just look ahead for a "fairway" and find your path through them. It gets easier with practice. On the way we saw our first Outward Bounders, a dozen or so stuffed in a small, open boat. 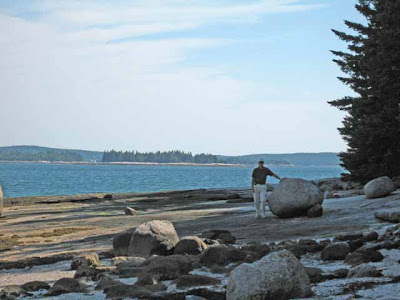 It's an outdoor adventure school that's based in Penobscot Bay at Hurricane Island. We had intended to get a dock but found they were all accounted for due to the Jazz Festival weekend event so we took a mooring instead at Knights Marine Service ($30) and found they had free laundry machines! I went to Hamilton Discount Marine to pick up my new depth sounder. Back on the boat, as I started to undo the fittings for the old display unit, I found the cables for the sounder and speed transducers to be crimped and bound to a post by the installer - to keep them from coming unplugged, I guess. Well, the crimp, over time, affected the depth readout because when I released the crimp in preparation for replacing the display unit, the depth sounder started reading correctly! So now I have a rather expensive Raymarine depth sounder I do not need. I'll watch things over the next few days to see if the problem is really solved and try to return the one I bought. Another rule of sailing: the best way to fix something is to buy an expensive replacement - you'll find that the original item broken suddenly works now! We plan on sailing east tomorrow, perhaps to Seal Bay, wherever the wind takes us. We have no more schedules, we're here to sail, it's great!